Mirror. But equally important, the editor has significantly expanded the range of the anthology. The book includes not only writers born since the previous edition, but also many fine poets overlooked inearlier editions or little known in the past but highly deserving of attention. The anthology confers legitimacy on the Objectivist poets; the so-called Proletariat poets of the 1930s; famous poets who fell into neglect or were the victims of critical backlash (Edna St. Vincent Millay); poets whose true worth has only becomeclear with the passing of time (Weldon Kees). Among poets missing from Richard Ellmann's 1976 volume but published here are W. H. Auden, Charles Bukowski, Donald Justice, Carolyn Kizer, Kenneth Koch, Stanley Kunitz, Emma Lazarus, Mina Loy, Howard Moss, Lorine Niedecker, George Oppen, James Schuyler, Elinor Wylie, and Louis Zukosky. Many more women are represented: outstanding poets such as Josephine Jacobsen, Josephine Miles, May Swenson. 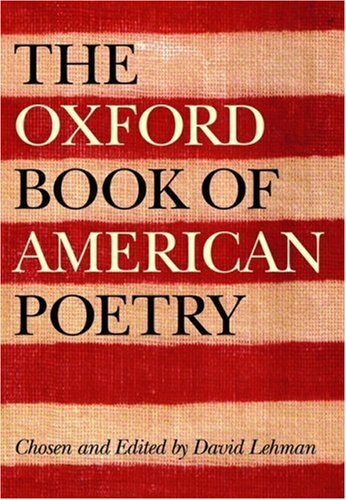 Numerous African-American poets receive their due, andunexpected figures such as the musicians Bob Dylan, Patti Smith and Robert Johnson have a place in this important work.This stunning collection redefines the great canon of American poetry from its origins in the 17th century right up to the present. It is a must-have anthology for anyone interested in American literature and a book that is sure to be consulted, debated, and treasured for years to come.